THE Davis Cup World Group quarter-final between Great Britain and France will take place on grass at The Queen’s Club, the Lawn Tennis Association has announced. Britain’s last tie, the victory over USA in March, was played indoor at Glasgow’s Emirates Arena but the desire to meet the French on grass has seen Queen’s win the right to stage the last-eight clash. The tie will take place between 17 and 19 July and will be the first time Britain has met France in 23 years, with the winners set to face either Australia or Kazakhstan in the semi-finals. 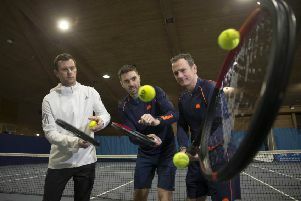 Leon Smith, captain of the GB Davis Cup team, said: “Queen’s Club will be a unique and special venue for this quarter-final tie against a very strong French team. “Our British team have all had very good results as individuals at Queen’s Club, in particular Andy Murray having won the event on three occasions. World No 3 Murray added: “Queen’s will be a perfect venue for our quarter-final match against France. I’ve been playing at Queen’s for ten years now so I feel very at home there as do the rest of the British team, so it’s a great choice. Meanwhile, Novak Djokovic is “the machine” who will get close to Roger Federer’s Grand Slam record and go down as one of the greatest players of all time, according to former British No 1 Tim Henman. Djokovic has already won the Australian Open this year and became the first man to win all three opening Masters events of the season when he triumphed in Monte Carlo on Sunday. The 27-year-old is favourite to lift his first title at the French Open next month, which would see him add to his eight grand slam victories and close the gap on Rafael Nadal and Federer, who have 14 and 17 respectively. Djokovic is yet to enjoy the same adulation as Federer, admired for his style, and Nadal, renowned for his athleticism, but Henman believes the Serb is starting to establish his own kind of dominance. “Djokovic is the machine,” said Henman, who was speaking in his role as a Jaguar UK ambassador after the luxury car maker was announced as the official car of Wimbledon. Henman added: “It’s the way he’s hitting the ball from the baseline, how aggressively he plays and how he does it with so few unforced errors. “And then his movement and his athleticism – his ability to turn defence into attack is as good as I’ve ever seen. I think he will be considered in the same class as Federer and Nadal. Djokovic overcame Nadal on clay – the Spaniard’s favourite surface – in the Monte Carlo semi-finals last week and has already beaten Murray in Miami and Melbourne, as well as Federer in Indian Wells this season. His imperious form has led many to suggest he could become the first male player to win all four Grand Slams in a year since Rod Laver in 1969. “In theory it’s possible, he’s looking so strong at the moment, but I think it’s unlikely,” Henman said. “The odds are against him because to win seven best of five matches is difficult enough but to do that four times in a year and remain injury-free is very, very difficult. Murray and Federer remain the principal threats to Nadal and Djokovic at Roland Garros but the era that saw the ‘big four’ win 34 out of 35 major tournaments between 2005 and 2013 appears to be coming to an end. Stanislas Wawrinka and Marin Cilic broke the mould with victories at the Australian and US Opens last year and Henman believes Canada’s Milos Raonic could be next to win a maiden Grand Slam. “Raonic would be my pick,” Henman added. “Grigor Dimitrov hasn’t played quite as well this year and Raonic has got such a big game, his serve is as good as anyone’s.